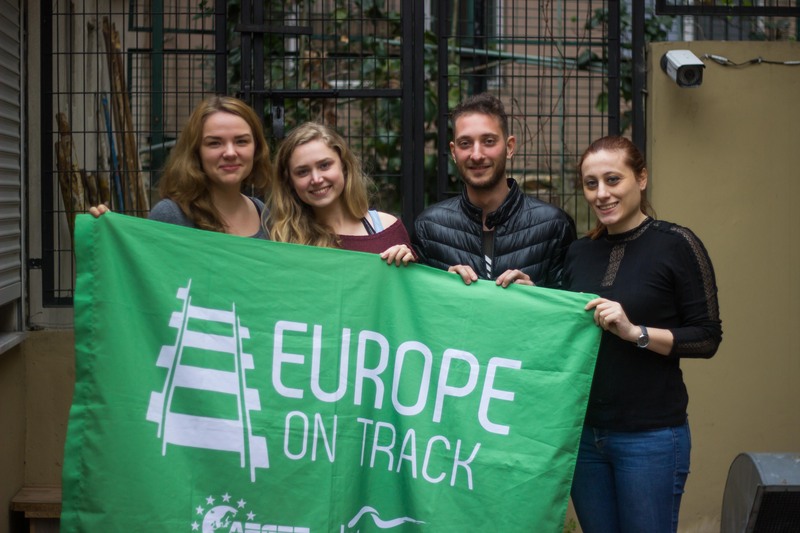 Ciao, Ahlan, Hallo, Kaixo, Hey and Tere from the Europe on Track 6 ambassadors to our dear blog followers! EoT 6 is kicking off tomorrow (finally! ), but this project would not be possible if it was not for our wonderful project team. While we will be the faces of the project while the routes are on, they are the brain that is making this edition possible, and that is why we would like you to get to know them better. 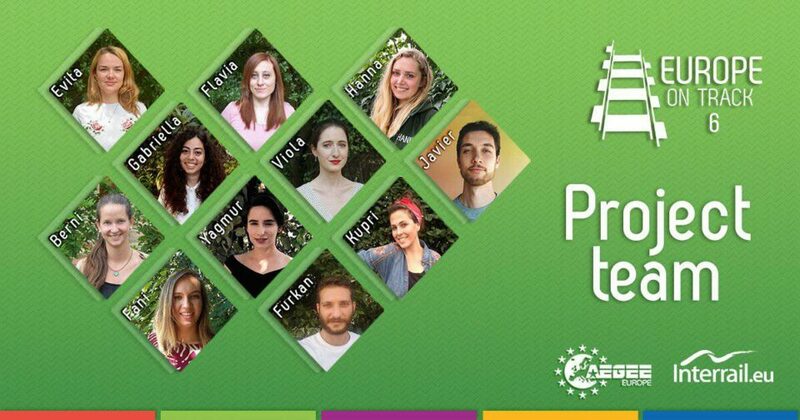 We interviewed the ones that are with us right now in Istanbul, that is to say: Flavia (Content Manager, AEGEE-Napoli), Evita (Project Manager, AEGEE-Heidelberg), Hanna (Route Manager, AEGEE-Tartu) and Furkan (Financial Manager, AEGEE-Istanbul). Question. Can you describe Europe on Track (EoT) in 3 words? Flavia Mariano. Trains, youth, borderless. Evita Ločmele. Dream, journey, curiosity. Hanna Alajõe. Teamwork, Europe, participation. Enes Furkan Kurt. Diversity, interactivity, awareness. Q. What is your role in EoT 6? FM. I am responsible for the topic-related part of the project, assisting the ambassador in the creation of the workshops and making sure what locals are organising fits the topic. EL. I overlook the whole project and make sure that the whole team is looking in the same direction. In addition, I focus on whatever the team needs to work on the most at the moment – starting from social media posts to budget lines. HA. I am responsible for the logistics of the routes, contacting all the locals, scheduling of the stops and also a first contact for the ambassadors during the route. EFK. I am responsible for the general budgeting of the project. In addition, I am responsible for the expenses of each step/event/action of the project from the beginning to the end. Q. Why did you decide to join EoT? FM. I had already organised and attended many stops in the previous years and was thinking about it. Further, it has been a tradition for my local to have one of its members being part of the project team, so when the open call was launched it was quite naturally for me to apply. EL. Mainly because of the aftermovie of EoT5, that I saw in Agora Krakow. It sent shivers down my spine and I just felt an intense urge to apply. I remember my interview for the project team as clearly as if it happened yesterday – I was super nervous and excited at the same time, but in the end, it went really well and now I am here, having the best people around me and doing the job that I love. HA. I joined EoT more than a year ago as an ambassador. At that point I joined because I loved the topic of sustainability from EoT5 and I wanted to take the chance to travel. The second time I joined to be a member of the project team, as I had fallen in love with the project as an ambassador and I wanted to make this experience as amazing as it was to me. It has literally changed my life. EFK. I was inspired that from such an easy-looking idea, we can actually create one of the biggest effects on Europe and AEGEEans. Moreover, to be in an international team after organising an Agora has turned into an addiction for me. EoT was giving this opportunity next to creating space for youth. For me, EoT is completely a unique experience that at least once in the lifetime, everyone should participate in. Q. How is the project financed? EFK. The project is financed thanks to Interrail, which makes the journey of ambassadors possible, and thanks to the “My Europe, My Say” Project, which is co-funded by the Erasmus + Programme of the European Union, and within which Europe on Track finds itself. Q. Describe the whole process until the project team and the ambassadors met in Istanbul. EL. It has been a long and wild ride, to be honest! We, the project team, started as a group of strangers excited about trains and borderless Europe. Today we are still in love with trains and Europe, but most importantly we have become friends, a team, a family. In between, we have had an open call for the hosting locals, selected 6 inspiring ambassadors, sent a lot of e-mails and Slack messages and made some rather tough decisions. The moment the ambassadors and project team met in Istanbul was magical – we clicked instantly and had many fruitful discussions. Exciting things are coming up! Q. How many locals are involved in this edition and what kind of activities are they organising? HA. In total 22 locals. With this many involved, the activities are also very diverse: several big conferences, many visits to high schools, meetings with local politicians, discussions with refugees and even Game of Thrones themed evenings! It is really wonderful to work with locals all over the network and see the wide variety of ideas and opinions turned into one big project. Q. What makes EoT6 special in comparison to the other editions? HA. This year EoT is together with Y Vote part of the bigger project “My Europe, My Say”, which is giving us a bigger platform to speak up about the future of Europe and also helping financially. We also differ from the past two editions as we are going to finish the routes on an external event, the Yo!Fest in Brussels on 30th of April, and not at an Agora, as it has traditionally been done. In addition, our closing conference will only be a month after the routes and shortly after the EP elections – in this way we can reflect on the election results through the thoroughly analyzed results of the project. For me personally, this project stands out also for the amazing level of teamwork I have never experienced before. Thank you to my teammates! Q. The previous editions of EoT had a more concrete topic. Why did you decide on a broader topic dealing with the Future of Europe through youth participation? FM. We felt that Europe is going across a very challenging period, and it was impossible for us to focus only on one topic ignoring the others. We also realised that youth in different part of the continent are facing different challenges so we decided to let the AEGEE local focus on what was the topic more relevant for them. Q. What excites you the most about Europe on Track 6? HA. As the route manager, I am very excited to see how the routes will turn out, how the ambassadors will work, how the logistics will not fail us (crossing fingers!) etc. There is nothing like EoT to connect so many locals at once! FM. It is amazing seeing how far the project has gone from the first live meeting in Brussels. I am excited for the ambassador to finally start the journey and see how things will go. Q. What can our readers do to support the project? EFK. Contribution to the routes is the first step. People are welcome to join at each stop and meet our six incredible ambassadors. Then, there will be a final conference in Alicante on the topic: “Europe After Elections: What is next?”. You are also welcome to this big final conference. However, if you want to contribute also by crowdfunding, you can check out our website and find our crowdfunding campaign and even get some cool prizes from EoT. EL. Join the events during the routes! Local organisers have worked hard to produce high-quality events, that are open to everyone interested. Moreover, the open call for the conference in Alicante, Spain, where we will talk about the future of Europe after the elections, will start on the 25th of March. Last but not least, a special praise goes to Gabriella (Social Media Manager), Viola (CD appointed person), Javier (Design Team), Berni (Design Manager), Yagmur (Internal Communications Manager), Fani (Social Manager) and Kupri (IT Manager) for all their hard work that has brought us Ambassadors and Europe on Track team together in Istanbul.